Atkins IK, NB Cook, MR Mondaca, CY Choi (2018) Continuous respiration rate measurement of heat-stressed dairy cows and relation to environment, body temperature, and lying time, Transactions of the ASABE, 61(5), 1475-1485. Wang X, G Zhang, CY Choi (2018) Evaluation of a precision air-supply system in naturally ventilated freestall dairy barns, Biosystems Engineering, 175, 1-15. Rojano F, P Bournet, M Hassouna, P Robin, M Kacira, and CY Choi(2018) Assessment using CFD of the wind direction on the air discharge caused by natural ventilation in a poultry house, Environmental Monitoring and Assessment, 190(12), 724, 1-15. Wang X, BS Bjerg, CY Choi, C Zong, G Zhang (2018) A review and quantitative assessment of cattle-related thermal indices, Journal of Thermal Biology, 77, 24-37. Drewry JL, M Mondaca, BD Luck, CY Choi (2018) A Computational Fluid Dynamics Model of Biological Heat and Gas Generation in a Dairy Holding Area. Transactions of the ASABE, 61:2, 449-460. Wang X, G Zhang, CY Choi (2018) Effect of airflow speed and direction on convective heat transfer of standing and reclining cows, Biosystems Engineering, 167, 87-98. Song I, P Romero-Gomez, MA Andrade, M Mondaca, CY Choi (2018) Mixing at junctions in water distribution systems: an experimental study, Urban Water Journal. 15:1, 32-38. Holstein AJ, DR Bohnhoff, CY Choi (2018) A computational and experimental study of conjugate heat transfer through composite thermal envelopes in post-frame buildings, Computers and Electronics in Agriculture, 149, 139-149. Drewry JL, CY Choi, JM Powell, BD Luck (2018) Computational model of methane and ammonia emissions from dairy barns: development and validation, Computers and Electronics in Agriculture, 149, 80-89. Ozdogan-Dolcek A, I Atkins, MK Harper, JM Tinjum and CY Choi (2017) Performance and sustainability of district-scale ground coupled heat pump systems, Geotech. and Geological Engineering. 35 (2), 843-856. Drewry JL, CY Choi, JM Powell (2017) Design and calibration of chambers for the measurement of housed dairy cow gaseous emissions. Transactions of the ASABE, 60:4, 1291-1300. Floria LJ, Hart D, Tinjum J, CY Choi (2017) Potential impacts to groundwater from ground-coupled geothermal heat pumps in district scale, Groundwater. 55:1, 8-9. Mondaca M, CY Choi (2016) A computational fluid dynamics model of a perforated polyethylene tube ventilation system for dairy operations, Transactions of the ASABE, 59:6, 1585-1594. Mondaca M, CY Choi (2016) An Evaluation of Simplifying Assumptions in Dairy Cow Computational Fluid Dynamics Models, Transactions of the ASABE, 59:6, 1575-1584. Rojano F, P Bournet, M Hassouna, P Robin, M Kacira, and CY Choi (2016) Computational modelling of thermal and humidity gradients inside a naturally ventilated poultry house, Biosystems Engineering. 151, 273-285. Andrade M, CY Choi, K Lansey, D Jung (2016) Enhanced Artificial Neural Network Estimating Water Quality Constraints for the Optimal Water Distribution Systems Design. ASCE Journal of Water Resources Planning and Management. 142:9, 1-14. Rojano F, P Bournet, M Hassouna, P Robin, M Kacira, and CY Choi (2015) Modelling heat and mass transfer of a broiler house using computational fluid dynamics. Biosystems Engineering. 136, 25-38. Drewry JL, CY Choi, An L, Gharagozloo PE (2015) A computational fluid dynamics model of algal growth: development and validation. Transactions of the ASABE. 58:2, 203-213. Ortiz XA, JF Smith, F Rojano, CY Choi, J Bruer, T Steele, N Schuring, J Allen II, and RJ Collier (2015) Evaluation of conductive cooling of lactating dairy cows under controlled environmental conditions, Journal of Dairy Science. 98, 1759-1771. Mondaca M, MA Andrade, CY Choi, KE Lansey (2015) Development of a cost function of water distribution systems for residential subdivisions, Urban Water Journal. 12:2, 145-153. Gharagozloo PE, JL Drewry, AM Collins, TA Dempster, CY Choi, SC James (2014) Analysis and modeling of Nanochloropsus growth in lab, greenhouse, and raceway experiments. Journal of Applied Phycology. 26:6, 2303-2314. Song I, T Dominguez, CY Choi, MS Kang (2014) Impact of tilling on biosolids drying and indicator microorganisms surviving during solar drying process. Journal of Environmental Science and Health. 49:14, 1701-1709. Song I, SA O’Shaughnessy, CY Choi, CP Gerba (2014) Impacts of tilling and covering treatments on the biosolids solar drying conversion from Class B to Class A, Environmental Technology. 35:20, 2610-2618. Mondaca M, F Rojano, CY Choi, K Gebremedhin (2013) A conjugate heat and mass transfer model to evaluate the efficiency of conductive cooling for dairy cattle, Transactions of the ASABE, 56:6, 1471-1482. Kim M, CY Choi, and CP Gerba (2013) Development and evaluation of a decision-supporting model for identifying the source location of microbial intrusions in real gravity sewer systems, Water Research, 47, 4630-4638. Tamimi E, M Kacira, CY Choi, L An, (2013) Analysis of microclimate uniformity in a naturally vented greenhouse with a high-pressure fogging system, Transactions of the ASABE, 56:3, 1241-1254. Anderson SD, BJ Bradford, JP Harner, CB Tucker, CY Choi, JD Allen, LW Hall, S Rungruang, RJ Collier, JF Smith (2013) Effects of adjustable and stationary fans with misters on core body temperature and lying behavior of lactating dairy cows in a semiarid climate, Journal of Dairy Science, 96, 4738-4750. Andrade MA, D Kang, CY Choi, K Lansey (2013) Heuristic post‐optimization approaches for design of water distribution systems, ASCE Journal of Water Resources Planning and Management. 139:4, 387-395. Atkins I, Choi CY, Holmes B (2016) Dairy Cooling: Benefits and Strategies. Atkins I, Choi CY (2016) Dairy Cooling in Arid and Semi-Arid Climates. Atkins I, Choi CY, Holmes, B (2016) Dairy Cooling in Humid Continental Climates. Atkins I, Choi CY, Bucklin R (2016) Diary Cooling in Subtropical Climates. Superior Paper Award, An Evaluation of Simplifying Assumptions in Dairy Cow Computational Fluid Dynamics Models, ASABE International Meeting, American Society for Agricultural and Biological Engineers (ASABE), 2017. Superior Paper Award, A conjugate heat and mass transfer model to evaluate the efficiency of conductive cooling for dairy cattle, ASABE International Meeting, American Society for Agricultural and Biological Engineers (ASABE), 2014. Superior Paper Award, Analysis of microclimate uniformity in a naturally vented greenhouse with a high-pressure fogging system, ASABE International Meeting, American Society for Agricultural and Biological Engineers (ASABE), 2014. Best Paper Award (one out of 106 presented papers), Axial Dispersion in Pressurized Pipe, 10th Annual Water Distribution Systems Analysis Symposium, American Society of Civil Engineers (ASCE), 2008. 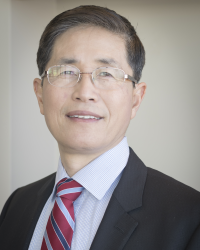 Dr. Choi’s research interests are in computational and experimental fluid flow and transport phenomena in conjunction with environmental, biological and agricultural engineering applications. His recent research activities have involved: (1) Microclimate simulation and control in livestock buildings, (2) Internet of Things (IoT) and precision agriculture, (3) Optimal design of urban water distribution infrastructures (water safety and security), (4) Microclimate control in greenhouses, (5) Transport and fate of pathogens in fresh vegetables and fruits (food safety), and (6) Computer modeling of algae biofuel production in raceways. He has worked with researchers whose backgrounds are in microbiology, animal sciences, electrical and computer engineering, and civil engineering. He has pursed multi-disciplinary research projects, while maintaining an independent research laboratory for computational simulations and experiments in transport phenomena.